Now in his second year as an assistant professor at Franklin & Marshall College, Dr. Mark Redondo Villegas is propelling students and colleagues to explore issues of race and identity. Based in the department of American Studies, he also collaborates across disciplines with Latin American Studies, History, Women’s, Gender and Sexuality Studies and Africana Studies. Students have responded enthusiastically to his courses, especially those who are interested in learning about their own origins. As a scholar and researcher, Villegas is interested in exploring how hip hop exists in the world and the large role Filipino Americans have played in the music genre. 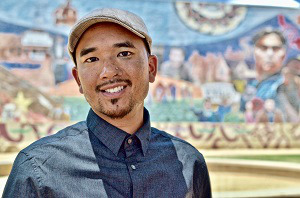 As a graduate student, Villegas created documentary films focused on politics and the cultural production of Filipino and Filipino American hip hop performers. He later contributed to and co-edited the anthology Empire of Funk: Hip Hop and Representation in Filipina/o America. “I’ve always been surrounded by hip hop. I’m personally embedded in this scene,” says Villegas, who moved multiple times growing up while his father served as a Navy steward. Willard refers to Villegas as a “public scholar” who has “brought a wonderful array of conversations to the campus and he’s developed some very creative courses,” says Willard, noting that his hip hop course has received an enthusiastic welcome. She says that, in this and other courses, Villegas uses historical and cultural materials, film and speakers to get students to understand history on a deeper level. Villegas says the idea of a Philippine nation free of colonialism is still forming and hip hop has been a way to reimagine spirituality, creativity and relationship with other people of color in similar circumstances. His current research examines spirituality, military culture, Afro-futurism (a science fiction genre) and dance culture. He is working on a manuscript tentatively titled Savage Vernacular: Performing Race, Memory, and Hip Hop in Filipino America. “All of these different genres I’m observing, I’m trying to make an argument of the importance of hip hop providing a certain erased memory in reminding people of the Philippines and Filipinos’ relationship to colonization and war,” he says.